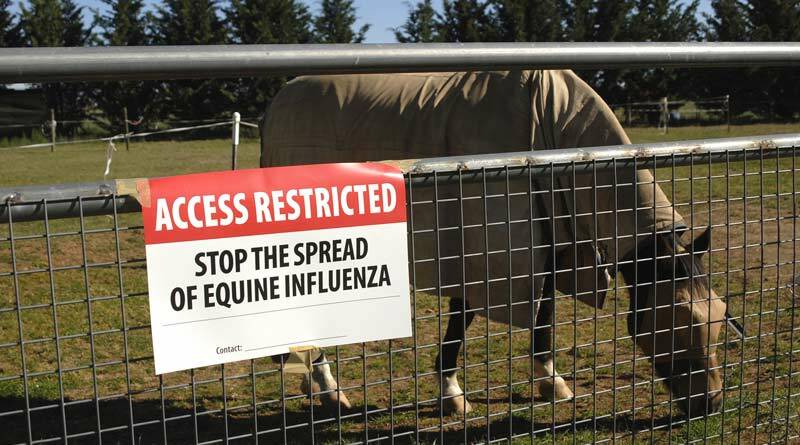 A vaccination strategy to eradicate any future outbreak of equine influenza in New Zealand would be cost-effective and should be a priority approach, according to researchers. Equine flu has never been reported in New Zealand. However, in 2007, an outbreak occurred in Australia, which had previously been free of the disease. The disease was controlled and eradicated through a vaccination programme, which included the use of buffer zones and movement restrictions. Testing of a horse for the flu virus. The outbreak spurred the New Zealand government and stakeholders into evaluating different flu control strategies. The aim was to economically justify any future decision-making on whether to eradicate or manage the disease should an outbreak occur. In essence, could a national eradication campaign in the country be justified economically? To build on the policy debate, Sarah Rosanowski and her colleagues carried out epidemiologic and economic modelling to evaluate alternative control strategies. Model results were input into a cost-benefit analysis framework to identify the return and feasibility of alternative eradication strategies in the country. They explored nine alternative eradication scenarios and two baseline strategies in their study, reported in the open-access peer-reviewed journal PLOS ONE. The alternative scenarios consisted of three vaccination strategies (suppressive, protective or targeted) starting at three time points to reflect the commercial breeding-cycle. These alternatives were considered against a baseline of movement restrictions in the breeding season (August to January) or the non-breeding season (February to July). The elements of economic loss considered were the response to the incursion, the impact on the commercial racing industry (breeding, sales and racing), horse ill health and mortality, and compensation to industry participants. “Results suggest that the economic viability of the equine influenza eradication programme is dependent on when within the breeding-cycle the EI outbreak occurs,” the study team reported. If an outbreak were to occur, the return on each dollar invested for protective or suppressive vaccination strategies would be between NZ$3.67 to NZ$4.89 in the breeding season and between NZ$3.08 to NZ$3.50 in the non-breeding seasons. “Therefore, protective or suppressive vaccination strategies could be prioritised, regardless of season,” they said. The researchers said that, as multiple industry stakeholders benefited from these strategies, the findings would enable policy development and would help in formulating a user-pays eradication programme. New Zealand, Iceland and Australia are currently the only nations free from equine flu. New Zealand had more than 25,500 horses listed in the Thoroughbred and Standardbred studbooks as at 2010, and the number of horses, such as sport horses and others outside the wider racing industry, is estimated at 31,255. The cost of the response to the Australian outbreak was $500,000 a day, including movement restrictions, surveillance, contact tracing and vaccination. In all, 10,000 properties and 140,000 horses were involved in the vaccination response that ultimately eradicated the disease. While the landmass in New Zealand is comparable to New South Wales and Queensland, the population of horses is smaller, and consequently any predicted outbreaks should also be smaller than what occurred in 2007. The cost of a New Zealand response was estimated at $250,000 per day for the first 70 days of the outbreak, plus two further weeks of heightened response. Subsequent to this, the cost of implementing an incursion response was estimated at $125,000 per day until the end of the outbreak. It was estimated that, on average, each affected property owner in Australia spent NZ$1500 (A$1414) on veterinary costs for all horses on their property. Of the 5% of horses that died, the average value per horse was determined to be NZ$14,200 (A$13,515). The loss of income for jockeys and drivers through the cancellation of races was also calculated, along with other losses identified. The overall loss for an outbreak in the breeding season was put at NZ$225.5 million, while in the non-breeding season it was assessed at NZ$174.9m. The additional cost of vaccination was $24.8m for suppressive vaccination strategies, $27m for protective vaccination strategies, and $36.6m for a targeted strategy. The net benefit of the suppressive strategy was $96.3m if implemented between August and October, and $62.1m if implemented in the non-breeding season. The net benefit of the protective strategy was $89.4m if implemented between August and October, and $58.4m if implemented in the non-breeding season. The net benefit of the targeted strategy was $20.1m if implemented between August and October, and $3.5m if implemented in the non-breeding season. The authors said a shorter outbreak will allow the more rapid resumption of normal activity, allowing for more wide-reaching benefits than those simulated within the current framework. “In contrast, the targeted strategy, where only horses involved in the racing industry were vaccinated, would be of greater cost than the baseline and not reduce the duration or size of the outbreak markedly. The authors said the breeding sector would experience its greatest losses if an incursion were to occur during the breeding season, due to a loss of breeding opportunities, live foals born and a decreased number of horses sold at sales. The study team concluded that the implementation of suppressive or protective vaccination strategies, particularly if an outbreak were to occur during the breeding season, was economically favourable when compared with the baseline strategy which centered on movement restrictions. The full study team comprised Sarah Rosanowski, Tim Carpenter, David Adamson, Chris Rogers, Patricia Pearce, Martin Burns and Naomi Cogger, who are with a range of institutions.